Glenn McGrath - giant-killer without peer? 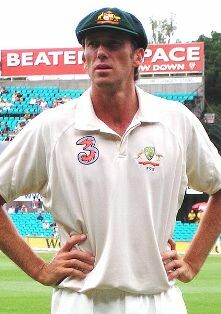 When Glenn McGrath removed all of England’s top six batsmen at The Oval in 1997, he appeared to exemplify the role of “giant-killer”. Oft-times, though, our perceptions are sometimes skewed by performances early in a player’s career to the extent that we only tend to see similar subsequent performances, because that’s what we’re looking for, i.e. they now have that reputation – it’s like the lottery, where we only notice the winning numbers, or coincidences, where we don’t see the thousands of non-coincidences that happen every day. Well, perhaps this isn’t as deep or metaphysical as that, but nonetheless I wanted to see if the perception was well-founded, i.e. that McGrath was a giant-killer and also perhaps to identify other, less heralded giant-killers. First we need to define what a giant-killer is. The accepted definition for a bowler is someone who takes the wickets of the top-rated batsmen, which we can generically quantify as those in the top order (i.e. wickets 1 through 7). The majority of bowlers fall into the category of a 3-4-3, that is for every ten wickets they take, three will be upper order (1-3), four will be middle order (4-7) and three will be from the tail (8-11). There are variations around this, e.g. McGrath was a 4-3-3, Warne a 2-4-4 and Ntini a 4-4-2, but the majority fall either side of the 3-4-3 category. There are exceptions to the rule of course (otherwise it wouldn’t be a rule) – Zaheer Khan for example is a 5-3-2, but this is not typical for bowlers with a lot of wickets, though most bowlers have around 70-80% of their wickets from the top order. Certainly McGrath stacks up well as a giant-killer, and although Murali and Warne took more top-order wickets, this was partially due to their sheer numbers of wickets, as McGrath had a significantly higher percentage of top-order wickets. Even so, Ntini in this list shades even McGrath and tops the percentage of top-order wickets of those shown above. Ian Meckiff was embroiled in controversy as a “chucker”, but his reputation as a giant-killer was firmly established in the 1958-59 Ashes when a six-wicket haul included England’s May, Cowdrey and Graveney. Meckiff measures as a 4-5-1, though Tapash Baisya was a 6-3-1 and he has the highest percentage of upper-order wickets to his name with 61.1% (22 of 36 wickets). Only India’s Raman Surendranath (6-2-2), who played only 11 Tests, comes close with 15 of 26 wickets from the upper order (57.7%). Some great names there, with the mighty Thommo, Vaas, Ntini and Ambrose to the fore. Considering the number of career wickets taken by McGrath however, he clearly stands out as a giant-killer over a sustained career of high-quality bowling, at least by this measure. So it would seem our perception is supported by statistics. However, I recently thought of another way to look at this. It’s not simply a case of taking the wickets of the top-rated batsman, for example he may have already scored 250 – clearly if he’s dismissed for a lower score that has more impact. The following table is based on the wickets taken by a particular bowler, looking at the runs scored by the batsman on his dismissal and comparing the score to his average. If the score is less than his average that counts in favour of the bowler, whereas if it is higher that counts against. For example, if McGrath dismisses Atherton (as he did no fewer than 19 times, though never bowled) for a duck that’s 37.69 runs in McGrath’s favour (Atherton’s average, 37.69 less zero) – if Atherton scores 41 that’s 3.31 runs against McGrath (41 – 37.69). If we total each bowler’s career wickets from the career average of each victim, that gives us a career “impact index” for each bowler, based on the average runs he “saved” from each batsman for his team. What the above is saying then, is that over the course of his Test career Glenn McGrath saved his team 7,103 runs below the average that the batsmen facing him would be expected to achieve, and that this is, by a significant margin, the highest number of runs saved ever. To illustrate how far ahead McGrath is, the gap between him and second-placed Courtney Walsh is almost as big as the gap between Walsh and 11th-placed Ntini. The above list contains most of the top-rated bowlers (though I’m not sure too many would have expected to see Matthew Hoggard in the top twenty, but it should be noted in his favour that he took by far the fewest wickets of those featured above, with 248), however it is noticeably heavy on fast men; this is probably because it measures ALL impact, whether positive or negative, which means if a bowler takes the wicket of a batsman who is already set then this counts against him. This isn’t fair (a bowler shouldn’t be penalised for taking a wicket no one else could get), and in any case what we’re really trying to identify is bowling giant-killers, so we should really only consider those wickets where the batsman was out for less than his average – the higher this differential is, the greater the giant killer. As an example, consider the case of Hedley Verity and his conquests of Don Bradman; Verity took Bradman’s wicket eight times in Tests, for 66, 71, 36, 13, 82, 13, 270 and 18 – that’s seven times for lower than his average and one time he dismissed Bradman at 270. If we used both positive and negative scores versus average, most of his good work in the seven lower innings is wiped out by the 270. McGrath retains his lead, though it is significantly reduced and we see that Murali is now number two, after not being featured in the previous top 20 list. A number of other spinners feature as wel as Murali – Warne, Kumble and Harbhajan Singh. All of those in the above list have taken more than 300 wickets, and certainly longevity is a factor in any aggregate measure. As an aside, it was interesting to me at least to see how close Lillee and Botham were. Certainly of the top wicket-takers McGrath is clearly the front-runner, and we are also reminded of what a loss Mohammad Asif’s banning is to the cricket world. Of course, the above lists also have the same bias which we saw earlier towards the quicks, as they typically open the bowling and get to enjoy the new ball each time. It is noticeable, however, that McGrath’s name figures highly no matter what measure we use. One thing which surprised me while compiling these lists, and which is highlghted by the presence of Peel above, is that older generation bowlers such as SF Barnes and George Lohmann are not featured. This could be because their opponents were of a lower quality (turn of the century South Africa on may occasions, who were decidely minnows at that time) with presumably lower averages to begin with, which would then affect their rating both on aggregate and with a reduced differential from the already low average. Certainly this has brought some older generation players into the top 20, such as George Hirst and Jack Saunders, and also I’ve given the numbers for some other notables who figured quite highly (indeed with one more wicket Hearne would have been ranked top) – I think that we’re seeing the effect of the overall lower averages in the pre-WW1 days being offset here. One more thing I’d like to touch on – Frank Tyson, who had the highest percentage of wickets taken below average (minimum 50 wickets) exhibited a phenomenal differential between his first and second innings averages; his first innings average was 29.08, whereas his second innings average was a scarcely believable 9.58! I’ll touch on this in a future article on pressure bowling – I think I’m already in danger of overstaying my welcome. For now, we can say that the “D” in “GD McGrath” could have just as easily stood for David (the most famous giant-killer) as it does for Donald. Excellent work! I always thought that one of McGrath\’s great qualities was that he consistently got top order wickets early. I expected to see the great Marshall, Ambrose, Akram, Lillee and Hadlee in there too, but this only helps prove that McGrath is arguably the best! Will be interesting to see where Steyn and Philander end up as they are both amazing bowlers as well.